The museum will be open from 9 a.m. to 7 p.m. Monday through Friday, 9 a.m. to 6 p.m. Saturday and 11 a.m. to 6 p.m. Sunday. The museum will be open from 9 a.m. to 7 p.m. Monday through Friday, 9 a.m. to 6 p.m. Saturday and 11 a.m. to 6 p.m. Sunday. Spring break is also a chance to take a tour of the museum’s fully-restored Pullman parlor car. The train car, normally closed to the public to maintain its preservation, will be open for tours during operating hours March 18-24. “With extended hours families might actually get to fully explore our almost nine acres of exhibits, but no promises! By the time you attend two unique Science Live demonstrations and four different shows in our newly equipped digital planetarium, you’re going to find yourself pressed for time,” said Linda Maisch, vice president for community engagement at SMO. “In addition to hundreds of hands-on experiences, upstairs in the smART Space galleries there are two awe-inspiring exhibitions — ‘Life Imagined: The Art and Science of Automata,’ showcasing life-imitating machines dating from the 1800s to contemporary times, and ‘Beautiful Minds — Dyslexia and the Creative Advantage,’ an exploration of the successes of those who think and thought outside the box when faced with challenges of dyslexia. There is a lot to see and do in a day, so we recommend showing up early,” said Maisch. Kirkpatrick Planetarium: 10 a.m., 11 a.m., noon, 1 p.m., 2 p.m., 3 p.m., 4 p.m. and 5 p.m. Monday through Saturday; and noon, 1 p.m., 2 p.m., 3 p.m., 4 p.m. and 5 p.m. Sunday. Please note that free tickets are required for planetarium shows and may be obtained at the planetarium. 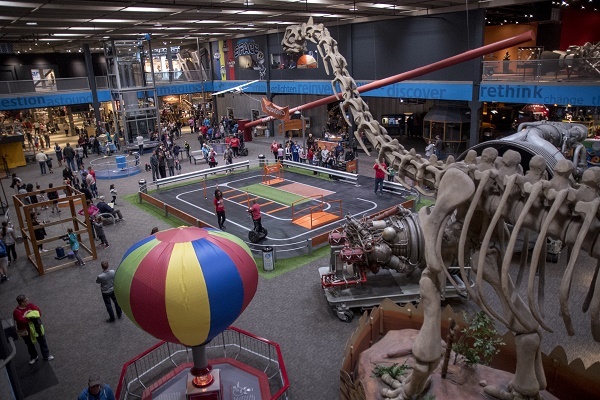 Daily general admission for Science Museum Oklahoma is $15.95 for adults (ages 13 to 64) and $12.95 for children (ages 3 to 12) and seniors (65 and older). Annual memberships begin at $105. For more information about Science Museum Oklahoma, visit www.sciencemuseumok.org.